€300 million investment needed to give people lives free from abuse, poverty and inequality, says activist Martin Naughton. 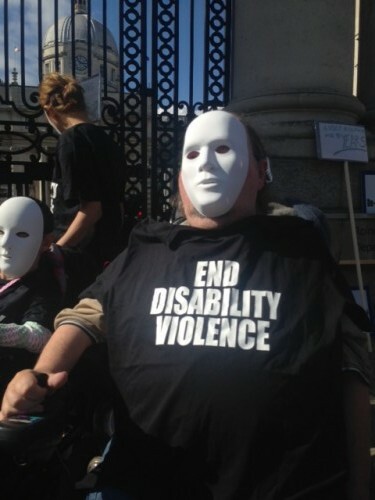 People with disabilities, led by campaigner and Director of Áiseanna Tacaíochta (ÁT), Martin Naughton, this morning started a 72-hour day and night vigil outside Government Buildings on Merrion Street to draw attention to the inequalities and abuses experienced daily by people with disabilities and their families because of funding shortfalls, successive cuts and policy failures. The street protest will continue until Thursday, September 17th. Naughton called for a €300 million investment in disability services and supports in Budget 2016 to make up for the savage cuts and complete lack of investment in the rights of people over the past seven years. Since 2008, spending on disability services has been cut by almost 10%– amounting to nearly €160 million. It is three years, almost to the day, since disability activists undertook similar day and night action against Health Service Executive (HSE) proposals to cut budgets for frontline services, home help and Personal Assistants (PAs). Naughton said that very little had changed in those three years, but the time for waiting was over. He said that now must be seen as a pressing and essential time to bring about lasting change for people continuing to live as second class citizens. “We have been patient; we have waited for the delivery of many promises and proposals, crumbs from the budget table, but today, Ireland’s 600,000 people with disabilities and their families are at breaking point,” he said. Over 68% of people who use disability services in Ireland are very dissatisfied with the poor quality of those services. Since November 2013, 93% of disability residential centres inspected by the Health Information and Quality Authority (HIQA) have failed to comply with national standards. Over the course of the action, the campaigners will focus on six key areas, from income to transport, to highlight the human cost of cuts and poor services. Naughton stressed that Government investment in disability must focus on policies and services that support people with disabilities to lead free, independent lives. This includes the introduction of Direct Payments, self-directed living supports and the protection of PA supports with a determined move away from residential care and congregated settings where possible. He also called for the ratification of the United Nations Convention on the Rights of Persons with Disabilities (UNCRPD) after eight years of waiting. Disability services have been cut by almost 10% or €159.4 million since 2008. The costs of living with a disability are estimated at over 35% of disposable income – or an average of €207 per week – but families where the head of the household is not at work due to illness or disability already have the lowest disposable income in the country. Over 93% of disability residential centres inspected by HIQA since November 2013 failed to comply with national standards – one in seven didn’t meet the standards at all. 8,000 people with disabilities in Ireland live in residential centres. 1,000 young people under the age of 27 with disabilities are currently living in inappropriate long-term care, including nursing homes. Essential services are not working. More than 13,000 children and adults are awaiting assessment for speech and language therapy. 7,000 people were registered on waiting lists for urgent occupational therapy last year. 38% of carers who look after someone in the same household report feeling overwhelmed by their caring responsibilities. For Inclusion Ireland’s press release, please click here.